929571	 LOST	 585 585	 WHITE	 D.Smith	 15703-A 1587 08/08/12	 g/30 865 OCA Elephant Fish Action Tnmt. 929604	 WON	 585 600	 BLACK	 C.Engelby	 15497-E 305 08/08/12	 g/30 865 OCA Elephant Fish Action Tnmt. 929636	 WON	 600 618	 WHITE	 K.Dunbar	 15291-D 404 08/08/12	 g/30 865 OCA Elephant Fish Action Tnmt. 929664	 DRAWN	 618 615	 BLACK	 J.Chen	 14680-R 498 08/08/12	 g/30 865 OCA Elephant Fish Action Tnmt. "Charles Moore-III is playing reasonably well. When playing Black, He should try to convert unfavorable positions into draws where possible. Charles has faced opponents with an average rating of 627.2. Charles should seek opponents of equal or greater strength in order to improve. He has improved by 557 points since 2010-09-25. 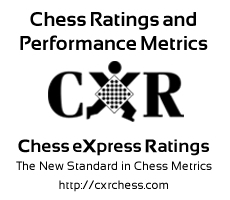 However, Charles Moore-III is also in a slump, off 103 points from a peak rating of 972 achieved on 2017-09-23. "